Fall roof maintenance prevents expensive roof replacements and repairs! Oh, the joys of living in Southeastern Michigan! Preparing your home and roof for winter in the fall can prevent a lot of hassles when it is freezing out and you’d rather be indoors. There are many fall maintenance things you can do to make sure your roof is prepared for the inevitable snow and prevent ice dams. 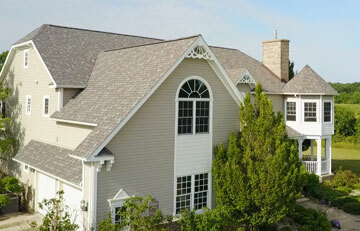 Replace any damaged, worn, cracked or curled roof shingles or tiles. Check your flashings to make sure water can’t enter your home. Repair any that are damaged. Inspect your soffits, fascia, and fasteners for fading or peeling paint, rust, loose or worn fasteners, and missing or cracked sealant. Check the insulation in your attic for any water damage or signs of animals. Attic insulation should have a uniform appearance. Look for droppings, food or other refuse. Remove animals before doing any sealing. If you’ve had a problem with ice dams in the past, you may want to add insulation to your attic. Also, make sure the airflow in your attic is properly balanced with working intake and outtake vents. Clean out your gutters and consider installing leaf guards. Look for any signs of trouble like asphalt granules, fasteners, or bits of shingle. Make sure to clean out your downspouts and that they are clear. They should drain away from the house. You may want to add extensions if you’ve had a problem in the past. Clear away any overhanging branches to at least six feet away to prevent them from falling on your roof in an ice storm. This also will prevent sap from dripping on your roof in the spring. If after your fall preparations you think you may need a new roof, we’re here to help! Whether you live in Chelsea, Dexter, Saline, Ann Arbor, or the other surrounding areas, we would welcome the opportunity to inspect your roof and provide a free estimate. We may even have finished one of your neighbors’ roofs and would be happy to provide references. Contact Us or give us a call at 734-662-3300 to schedule your Free Estimate!